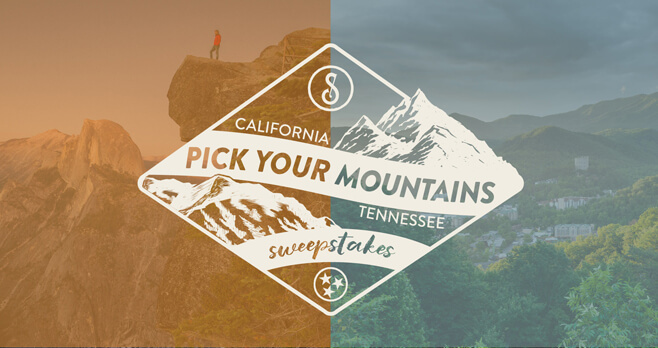 Sugarlands Distilling Co. is offering you the chance to win a weekend getaway in the Great Smoky Mountains National Park or Yosemite National Park. Visit sip2win.com and register for the Pick Your Mountains Sweepstakes now. Who Can Enter? The Sugarlands Distilling Company Pick Your Mountains Sweepstakes is open to all legal residents of the 50 United States and the District of Columbia who are at least 21 years of age as of the time of entry. When To Enter? Sweepstakes begins at 12:00 a.m., ET on April 10, 2018 and ends at 11:59 p.m. (ET) on May 30, 2018. What Is The Sweepstakes Prize? The Grand Prize consists of a weekend travel package for winner and one guest to one location of their choice between either the Great Smoky Mountains in Gatlinburg, Tennessee or Yosemite National Park.